We are so pleased to be able to offer our Frankfurters to caterers across the U.K.
After many trials and tweaks, as well as visits to German artisan butchers, and purchasing some of the best equipment used by these same ‘metzgers’, we now produce what we believe to be the best authentic German style frankfurter, here in Yorkshire, using local meat. 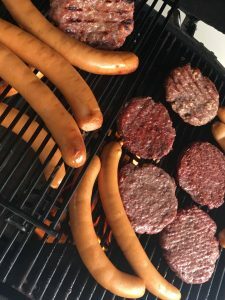 They are a genuine German style of frankfurter, made with pork shoulder and belly from Yorkshire outdoor bred pigs and finely blended to a smooth texture which has that traditional ‘snap’ when bitten into. They are mostly used as hotdogs in a roll, or served with sauerkraut and mashed potatoes. They are cooked and smoked over beech and oak wood. We vacuum pack them into 20’s, and they measure approx 22cm. Because we use natural skins, the length varies a little, but the weight is still around 115g. They simply need reheating in simmering water or on the grill, for 7-10minutes before serving. We use British welfare pork. Just the shoulder and belly, to make the best ‘franks’. We do not cheapen our sausage by adding ‘mechanically recovered meat’ and chicken from dubious sources and countries. Our main customers are festival caterers, pubs (particularly those with beer gardens) and restaurants looking for a simple and easy to assemble dish, as well as large private parties. We make and freeze these immediately. We ship them frozen in chill boxes for you to refreeze or sell. 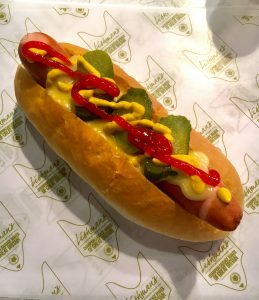 If you require a different size, or perhaps some Bratwurst or Franks with Cheddar, these can also be made to order. Minimum orders apply. All you need to do is ask!